I don't know about you all, but I just spent a little more money than I'd like to admit on a nice vacation with my husband...that means my funds for the upcoming Nordstrom Anniversary Sale are pretty slim (and let's not forget the Lilly Pulitzer After-Party Sale is coming up soon, too!). I'm not rolling in dough by any means, but that doesn't mean I can't score some great deals during the #NSale! Today I'm sharing some budget-friendly tips to keep in mind while you're shopping + some of my favorite Anniversary Sale picks under $50! Last year's leopard and burgundy look was a fall favorite! Shop Your Closet | Dump out last season's tub o' clothes and assess your fall wardrobe at a glance. Do you need a new pair of skinny jeans? Are some of your favorite staple sweaters starting to pill? Make a list of items you'd like to snag for this season and try to shop for those. It will limit your impulse shopping and help save you money in the long run by not buying too many things outside of what you actually need. A classic trench coat is worth the splurge when you can count on it's timeless style. Quality Over Quantity | I know how hard it is to drop $50 on a shirt (trust me), so keep quality in mind when making any purchase. I'm always willing to spend more on an item I know I can get several years out of, so I opt to buy my trendier pieces from cheaper stores and shop for staple items (like boots, chambray shirts, and basic denim) from more trusted brands. Also remember: Expensive does NOT always equal High Quality!!! Who doesn't love a little fur? This plaid top was perfect during the holidays but will also see a lot of wear this fall. Look Forward | It's not always easy to justify a purchase when you can't immediately enjoy it or use it, but it's far better to score a deal now than to pay full price in a couple months. Keep your fall wardrobe in mind (did you make your list?) when you're shopping the #NSale and try to spend your money wisely. Summer is almost over, so drop your cash on a new jacket or sweater instead of another strapless sundress. 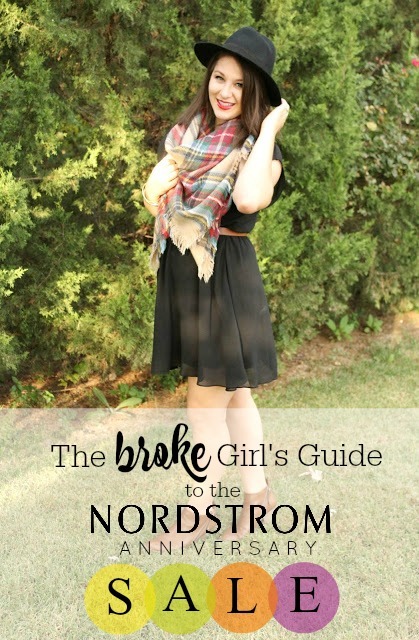 Now on to some of my affordable style picks! All of these items are under $50 while the sale lasts and you can gain early access to them by signing up for a Nordstrom Credit or Debit card! The Early Access sale runs from July 13 - July 20 and public access runs from July 21 - August 6. If you want first dibs on anything, definitely consider becoming a cardholder, as things do sell out fast! This is the year of the statement sleeve and there are so many cute, affordable options here! I always love a good slouchy sweater, too, so I definitely purchased a couple of those. I also scored that leopard scarf for just $11 to replace my old one. Kendra Scott makes the most beautiful, high quality jewelry so I was excited to see a few of her pieces included in the sale! Whew! Sometimes these sales are overwhelming and the urge to impulse buy gets the best of us. Thankfully Nordstrom has free shipping and free returns, so any spur of the moment purchases that lead to buyer's remorse (or husband's disdain) can be quickly undone. It's hard to reel your emotions in during a big sale that's being blasted at you from every fashion blogger out there, so hopefully these tips help you shop smart and save a little! Let me know what you're wishlisting for fall and if you did any #NSale shopping!